A poster on the side of a bus stop in downtown Washington D.C. read: “Let 340B,” clearly a sign of an organized campaign asking Congress not to interfere with the gravy train for some hospital systems that this obscure provision has become. The safety net drug program, usually referred to as 340B for the section authorizing it in the Public Health Service Act, was created by Congress in 1992 to require pharmaceutical companies participating in Medicaid to provide their drugs at deeply discounted prices to hospitals and other facilities that serve a disproportionate number of indigent and uninsured patients. The program has expanded dramatically over the last 26 years. It first applied to just a few hundred “health care entities”—charity hospitals and federally-qualified health centers. Since then, the program has grown substantially to more than 12,000 qualifying entities. The program’s growth accelerated when it was opened in 2010 to pharmacies that contract with 340B entities. The safety net drug program initially provided drugs to hospitals serving a disproportionate number of lower-income, uninsured, and vulnerable patients. There was no requirement about how many patients they must treat or even that the savings from the discounts they receive go toward providing discounts or direct care to these patients. With the high growth and consolidation of the health sector and with accountants looking in every corner to enhance the bottom line of hospital systems, it is no wonder that this lucrative program was seen as a way to boost revenues. Hospitals could acquire a drug for $5,000, for example, but charge health plans $10,000. Patients could also be required to pay a co-payment based upon the listed price of the drug. And many hospitals are extending the reach of the program by buying clinics to expand their ability to get the lucrative 20-50% discounts under the safety net program. This is challenging the integrity of the program and its mission. Some hospitals that reap discounts under 340B have a poor track record of justifying their charity status because they do not provide any more charity care than their for-profit competitors. As of 2015, there was only a 1% difference in the amount of uncompensated care provided by 340B qualifying hospitals in comparison to non-340B qualifying hospitals. The Trump administration’s “American Patients First” blueprint on prescription drug prices reports that 340B purchases increased from $12 billion in 2015 to $16 billion in 2016—a 50% increase in just one year—and to $19 billion in 2017. This explosive growth directly impacts the cost of medicines. Companies consider all sales channels and their volume in pricing their medicines. As more and more entities claim 340B status, the deep discounts ultimately push up drug prices for patients with private health insurance as companies seek revenue to finance their research and development into new drugs. 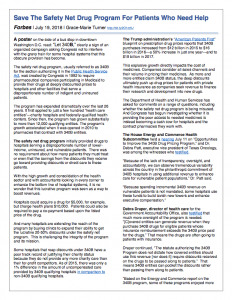 The Department of Health and Human Services has asked for comments on a range of questions, including whether the safety net drug program is being misused. And Congress has begun investigating whether it is providing the poor access to needed medicines is instead becoming a cash cow for hospitals and the contract pharmacies they work with. The House Energy and CommerceHealth Subcommittee held a hearing July 11 on “Opportunities to Improve the 340B Drug Pricing Program,”andDr. Debra Patt, executive vice president of Texas Oncology, was among the witnesses who testified. “Because of the lack of transparency, oversight, and accountability, we can observe tremendous variability across the country in the philanthropic commitment of 340B hospitals in using additional revenue to enhance care for vulnerable patient populations,” Dr. Patt said. Debra Draper, director of health care for the Government Accountability Office, also testified that much more oversight of the program is needed. 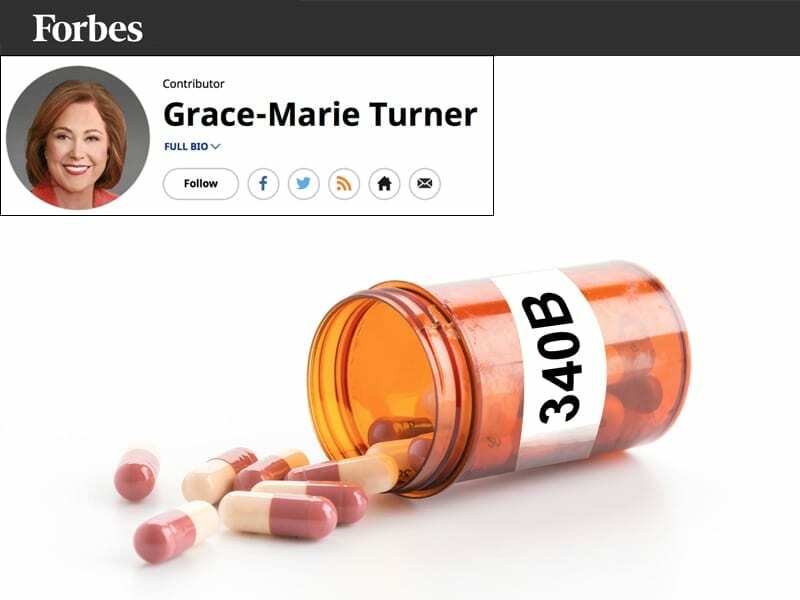 “[C]overed entities can generate revenue when they purchase 340B drugs for eligible patients whose insurance reimbursement exceeds the 340B price paid for the drugs.” That means the drugs are often going to patients with insurance. Draper continued, “The statute authorizing the 340B Program does not dictate how covered entities should use this revenue [nor does it] require discounts received on the drugs to be passed along to patients.” That means 340B entities can pocket the discounts rather than passing them along to patients. “Based on the Energy and Commerce report on the 340B program, some of these programs enjoyed more than $100 million in drug savings in 2016,” Dr. Patt testified. Independent studies have shown that the expansion of 340B is driving up health spending across various parts of the health sector. With cancer care being consolidated into expensive settings that are now considered hospital outpatient departments, previously called “doctors’ offices,” costs of care don’t just double, they can quadruple, with no added value. Dr. Patt recounted a number of case histories of patients desperately in need of timely treatment for cancer but being denied by 340 hospitals. She said “a 340B qualifying hospital declines to provide care for uninsured or underinsured patients for systemic chemotherapy. They require cash payments for this group of patients prior to administering therapy.” The requirement for cash payment is a denial of care for those unable to pay. But the program’s mission is being diluted, with hospitals in affluent areas profiting from 340B and hospitals in lesser-served areas still lacking the resources to adequately serve their patient populations. Further, patients, including those who are economically disadvantaged seldom see savings from the program. “Multiple reviews by non-partisan auditors have identified challenges within the program’s current operation and oversight,” Subcommittee chairman Michael Burgess said in opening the hearing. “I am concerned that many of the covered entities that the GAO reviewed do not have a policy in place that ensures uninsured, low-income patients are not hit with a big hospital bill for their outpatient drugs”—among many other concerns the chairman raised. That makes it ever more important for Congress to provide much stricter oversight of the program to ensure it is serving its original purpose. One legislative initiative, the 340B PAUSE Act, would temporarily freeze the number of entities participating in the program while the program is refocused on meeting its original goal of helping hospitals serve their most vulnerable patients. Sponsored by Rep. Larry Bucshon, R-IN, the legislation would also require 340B entities to report on the types of patients served and the amount of charity care they provide. To protect the program and the people who rely on it, it is time to set the PAUSE button and make both regulatory and legislative changes to keep the safety net drug program focused on its mission to provide needed medicines to needy patients. Greater oversight, transparency, and accountability are needed to make sure it addresses the needs of those for whom it was designed rather than lining the pockets of hospital systems. Next Article: Can Medicare Pay Market Rates?